Talk to us about organising activities on the estate including clay pigeon shooting, beekeeping masterclasses, artisan cheese tasting etc. Letterkenny has two terrific arts venues in An Grianan and the Regional Cultural Centre (RCC). An Grianan (www.angrianan.com) is a theatre space that has a full, year-round programme of quality events – from touring plays and comedy shows, to international music acts and local drama productions. The bright and airy Regional Cultural Centre hosts niche music performances (jazz, folk, trad, blues), art exhibitions and film screenings. Both spaces are key venues for the excellent Errigal Arts Festival, which presents a world-class programme of indoor and outdoor events all over the county each July. Century Cinemas in the Retail Park offers a really comfortable cinemagoing experience, and screens all the latest blockbusters as well as some more unexpected titles from time to time. It’s a very convenient complex for keeping young families entertained on a wet day, with a synthetic ice rink next door (open during winter) and a soft play facility adjoining a diner. If golf is your sport, you won’t want to leave Donegal – the county is awash with notable courses, often boasting spectacular Atlantic views. Ballyliffin Golf Club, Portsalon, and Letterkenny Golf Club are all within easy reach. Letterkenny is super for shopping. The Retail Park is a convenient cluster of high street stores, while the Main Street and Shopping Centre have plenty to offer along similar lines. Some of the more interesting, specialist shops include The Counter (for local produce and a good, strong coffee); Mourne Antiques (for antiques, jewellery and crafts); Moonshine Coffee Shop and Craft Studio (for Donegal pottery, tweeds and art); Foy & Company (for giftware and home interiors); Crafty Kids (full of creative hobby products for children); and if you’d like to stock up on sporting gear in Donegal county colours, try Elvery’s or Michael Murphy Sports and Leisure. The nearby townland of Lismonaghan is host to the Letterkenny Artisan Market every Saturday (10am-3pm at Carrygally Business Park) and on the last Thursday of each month (5.30pm-9.30pm) – a great place to buy fresh farm produce, tasty street food, vegan treats, and local crafts. If you’re venuturing a little further afield, shopping spots to check out include McElhinneys in Ballybofey, a traditional family-owned department store famed for its bridal wear and dazzling window displays at Christmas time. The Derry Craft Village is worth checking out if you’re taking a trip to the Walled City; and if you’re looking for traditional Irish musical instruments try Mulroy Music in Milford, just 20 minutes outside of Letterkenny. The Molloy Family intend for Rockhill to become a hub of sustainable, organic horticulture in Co. Donegal, sustaining the house and creating the fresh, seasonal produce that will be on offer at Rockhill’s festivals and fairs in the market yard. There will be artisan food and craft producers working on site, too – and their sustainable endeavours will be the beating heart of these events. There will be themed occasions, with cover provided on bad weather days, and visitors can expect everything from the culinary, to the cultural, to healthy living and wellness events. Keep an eye on the news section for upcoming dates to look forward to! Rockhill is ideally situated near the Northern beginning of the famously spectacular Wild Atlantic Way – every way you turn there’s something new and beautiful to behold! Here are a few ideas to get you started. Letterkenny sits on the south bank of Lough Swilly, one of only three glacial fjords in Ireland. 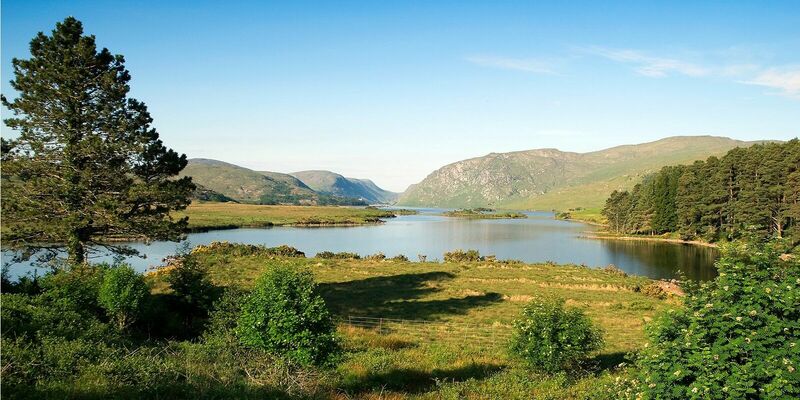 Rich with wildlife and dense with history, the lough really is the heart of North East Donegal. There are many vantage points from which to enjoy it – Manorcunningham View, just ten minutes drive from here, overlooks it from an impressive height – but the Swilly is perhaps best experienced on a ferry trip in summer from pretty Rathmullan on the west shore to the lively town of Buncrana on the east. (Service timetables and fees are at www.swillyferry.com.) Skimming the surface may not satisfy the more adventurous traveller, however – there are incredible dives to be done here, including to the wreck of the SS Laurentic, sunk by a German mine in 1917. For diving expeditions, see www.divindec.com or www.mevaghdiving.com. Situated just 24km north west of Letterkenny, the truly epic Glenveagh is the second largest of Ireland’s six national parks at 170 sq km. It is home to the country’s largest herd of red deer and site of a pretty 19th century castle and glorious ornamental gardens that sit in studied contrast to the breathtakingly craggy mountain landscape. This round stone fort, with origins dating to 1700BC, sits on a high hill top just 20 minutes drive from here above Burt in Inishowen. It is one of only five Irish sites mentioned in the 2nd century Ptolemy’s World Map. The view, as you walk its top internal terrace, is magical and vast; taking in swathes of counties Donegal, Derry and Tyrone and soaking up the Swilly and Foyle. The Inishowen fort, which was built by the Royal Navy during the Napoleonic Wars as a coastal defence, now houses a military museum including a large collection of naval guns. As well as a wildlife exhibition (this is an oasis for unusual birds), the Saldhana Suite on the site includes the Rockhill Collection of military memorabilia – on loan to the museum from two soldiers who served here at Rockhill when the house was under the ownership of the Irish Defence Forces. The intriguing history is only one aspect to the appeal of Fort Dunree – the setting is truly spectacular, with a unique light and quiet to take in on the signposted cliff walks and around the old military camp. Dunree Head has also become known as one of the best places in Inishowen to catch a glimpse of the Northern Lights. It’s just a 35minute drive from Letterkenny to Ards Forest Park, and it’s the perfect place to pass a long day. This is a forest by the sea – stepping out from under the trees on to the winding wooden boardwalk that brings you along to the golden beaches of the Sand Dune Trail is an experience you’ll not forget. There are marked trails of varying lengths and difficulty – take a few of them together and you could be walking for a full six hours! There’s an excellent children’s play area, plus a cafe in a wooden cabin that opens during high season, and plenty of picnicking spots. Don’t begrudge the €5 barrier fee as you enter (just be ready with the coins!) – you will be repaid many times over in enjoyment. This St Patrick’s Day (2017) it will be 200 years since light first shone from the tower here, over the Swilly and out in to the North Atlantic Ocean. Poised on the head of the Rosguill peninsula in the Irish speaking (Gaeltacht) area of the county, the light house is a most memorable signature point on the Wild Atlantic Way. Tours of the building – and up the steep 76 steps to the top – cost €5/€8 and come highly recommended (see fanadlighthouse.com for opening hours). Look out for leaping dolphins in the cove beneath! 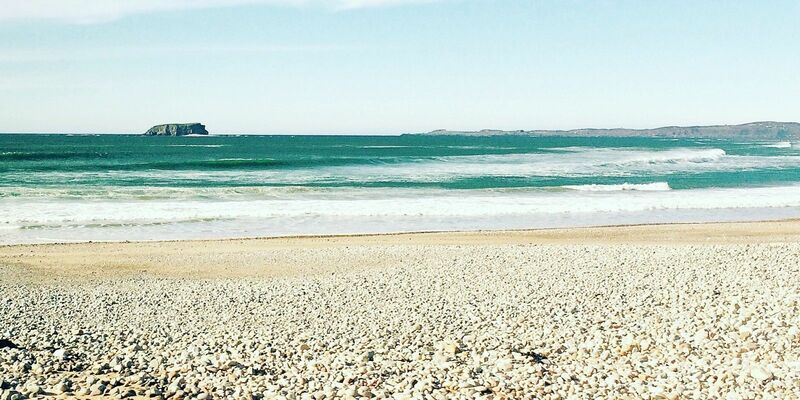 Honestly, you’ll be spoiled for choice – from vast sandy strands to tiny undiscovered crystal coves, there’s no better county in which to be by the sea. The closest beach to Letterkenny is Rathmullan, while the nearest ‘Blue Flag’ designated beaches are Portsalon, Downings, Marble Hill, Killahoey and Lisfannon. 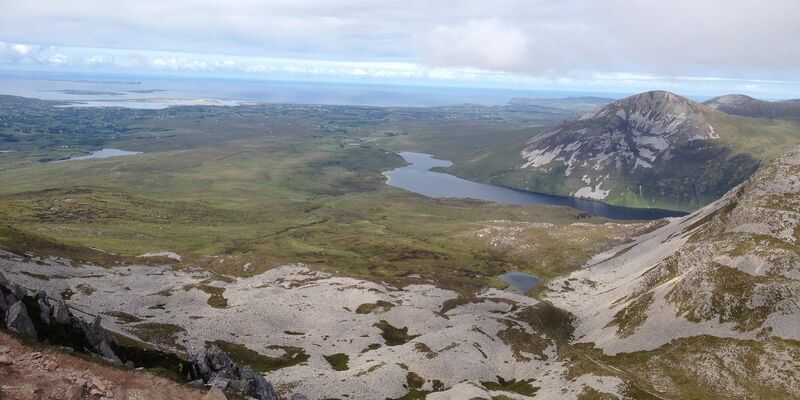 Donegal’s tallest and most iconic mountain at 751metres is a steep but fairly swift and refreshing climb – and the view once you get above the weather-filled clouds is incredible. It’s a 40minute drive from Letterkenny to the carpark off the R251 where the walk starts: bring good footwear and waterproofs! A 16th Century fortalice surrounded by water on three sides at Sheephaven Bay, Doe Castle was a stronghold of the MacSweeney clan and a point of refuge for Spanish Armada sailors in 1588. Its long and lively history can be learned in colourful detail on the popular castle tours that take place on weekends in July and August.